Part 3 of 8 in our Blog Series on Howard Gardner’s Theory of Multiple Intelligences. An intrapersonal learner is characterized by a solitary and independent learning style. This type of learner prefers to work alone rather than in groups and learns better through self-reflection rather than engaging in more extroverted activities like discussions with others. A learning style is an individual’s preferred style of learning. If your child has a particular learning style it doesn’t mean he or she cannot learn in other ways, it just means they learn best in one particular way. If your child’s preferred learning style is intrapersonal learning, we’ll help you understand how you can cater to their style of learning. There are a number of ways you can help your child learn in their preferred style, we’ll go over a few of them for you in this post. Here are some ways you can help your child excel in school, and in life if he or she is an intrapersonal learner. One of the top recommendations for intrapersonal learners is to get them to keep a journal of self-reflection. Have them write in the journal what they learned throughout the day, how they’re feeling about their performance in school and any other important highlights that happened in life. This gives your child the opportunity to reflect daily on what they have learned and put it in their own words. Getting in the habit of keeping a journal could help your child better understand what they’re learning in school, as well as teach them how to express themselves in writing. Intrapersonal learners prefer to work alone. We understand that as parents you want to give your child as much help in school as possible, but if your child is an intrapersonal learner they may prefer to be left alone when working on homework or projects. Give your child the opportunity to work alone if that’s what they prefer. Get to know when they really need your help with something, or when they would be better off completing a task independently. Since intrapersonal learners learn best by themselves, it’s best to nurture that skill at a young age. You can do this by encouraging your child to engage in small independent research tasks. Give them a general idea of a topic, and have them report back to you with as much information as they can gather on it. If your child needs some extra encouragement, you could even include some type of reward for completing the task. 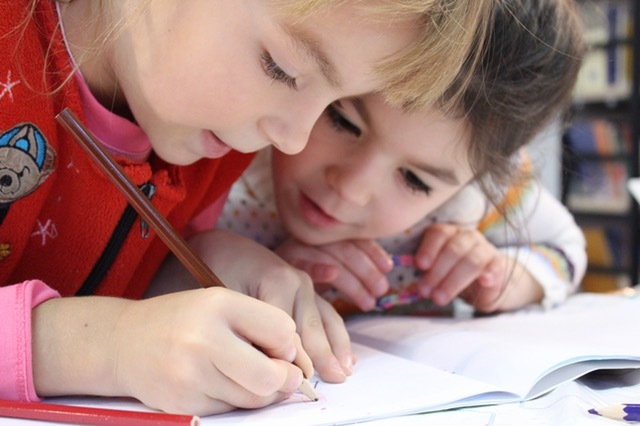 Through these tasks, your child will learn how to teach themselves about a subject, which will create excellent research and study skills for years to come. As an added benefit, your child gets to learn about a variety of subjects they may have otherwise not been exposed to. Intrapersonal learners would rather solve a problem by going somewhere quiet and working through it alone, compared to talking the problem through with someone else. That’s perfectly OK because intrapersonal learners can excel just as well as interpersonal learners can, or as well as any other learning style for that matter. If you would like to learn more about your child’s learning style, we encourage you to have them try some of our free games which explore the full range of a child’s multiple intelligences. This is part 3 of our blog series covering all 8 of Howard Gardner’s proposed 8 intelligences. Click here to view part 2. An interpersonal learner is naturally adept at working with other people. They have a keen understanding of people and the differences that exist from person to person. You might even say their ability to relate to others is uncanny; it’s almost instilled in them without having to be taught. An interpersonal learner excels at seeing things from other people’s points of view. It’s easy for them to understand how people think, feel, and relate to one another. While interpersonal learners are empathetic by nature, their understanding of people may lead them to resort to manipulation at times to get what they want. For the most part, they are peacekeepers and enjoy cooperating with others; they can also make very organized leaders. An interpersonal learner is strong in both verbal and non-verbal communication. When learning in school they like to have as much one on one time with the instructor as possible and keep a close circle of friends as a support group. They would prefer to work through ideas and issues with a group rather than on their own; often staying after class to talk with their peers. Socially, an interpersonal learner naturally wants to hang out with others doing group activities rather than be on their own pursuing their own interests. Card games, board games, and sports are popular activities for interpersonal learners. Here’s a good example of how interpersonal learners learn. Let’s say your child is this type of learner and they are having difficulty grasping a particular concept in school. You could have your child interview someone you know who knows a lot about that subject. The person to person communication will help the child understand the concept better. Another unique learning technique that suits interpersonal learners quite well is role-playing. For example, teach your child about a career they’re interested in by role-playing it with them. Or if they’re struggling to learn and/or remember something from history class, try role playing the event with them over and over until it clicks in their mind. If your child is having difficulty understanding anything in school, think of how you can tear it into a role play to help them learn better. Interpersonal learners usually grow up to work in fields where they work with others on a day to day basis. This could include professions such as a counselor, salesperson, or a politician to name just a few. This is part 2 of our blog series covering all 8 of Howard Gardner’s proposed 8 intelligences. Click here for part 1. This entry was posted in Blog on March 13, 2017 by admin.